Laser Dentistry: No Numb Lips = Happier Patients! The miracle we’ve been waiting for is here: The Solea Laser. Now available to our patients, Solea is a powerful dental laser that replaces the dental drill in the majority of procedures in our practice. In fact, nearly every patient skips local anesthesia (i.e. numbing!) because they just don’t need it. Solea is our way of keeping our child patients happy. Because more than anything, we love to see them smile! 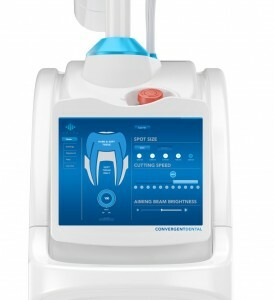 The Solea CO2 laser is the ideal instrument for performing tongue and lip-tie release (i.e. frenectomy). This procedure is used to correct a congenital condition in which the lingual (tongue) or labial (upper lip) frenulum is too tight, causing restrictions in movement that can result in significant difficulty with breastfeeding, and in some instances, other health problems like dental decay or orthodontic issues, speech problems, and digestive disturbances. Approximately 5% of the population has the condition, and your lactation consultant or physician may feel that a procedure is warranted to improve symptoms. Dr. Stacey uses the Solea laser to release the tethered oral tissues, providing greater mobility in the tongue and/or lip. Solea is the first CO2 dental laser system cleared by the FDA for hard, soft and osseous tissue procedures. Solea offers a unique wavelength guided by sophisticated computers to deliver virtually painless dental procedures for both teeth and gums from simple cavities to complex surgeries. The experience is so unique that kids will find it hard to believe they were just at the dentist. Check out this great video from one of our kiddos who loved the new Laser!!!! The majority of hard and soft tissue procedures in our office are done with virtually no anesthesia and soft tissue procedures are done with virtually no bleeding. Blood-free and anesthesia-free procedures represent a major leap forward in dentistry, as we are able to execute multi-quadrant dentistry, fillings, and soft tissue procedures in a single appointment. What does that mean for you and your child? Your child is now able to receive the care they need in less time without having to experience the numbness that goes along with injections. With Solea, kids can go back to school (and you back to work! ), without that numb sensation following their appointment. Solea is truly changing what it means to go to the dentist.